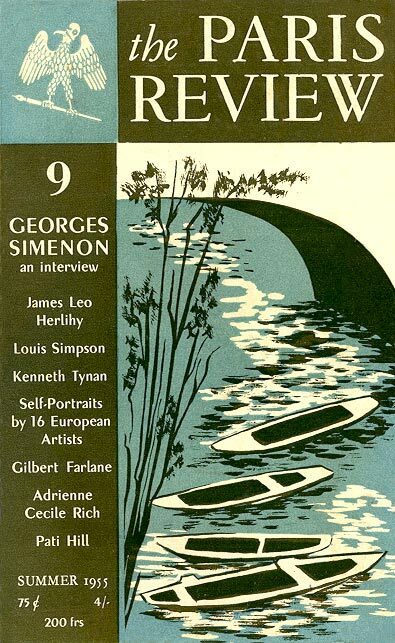 André Gide, who was writing a study of Georges Simenon's fiction at the end of his life, called Simenon "perhaps the greatest novelist" of contemporary France. Simenon published his first novel, Au Pont des Arches, at seventeen, and by writing it in ten days began at once his phenomenal practice of rapid production. Using at least sixteen pen-names ranging from Christian Brulls to Gom Gut, he began writing scores of commercial novels  one of them in exactly twenty five hours  with the intention of training himself for more serious works. He shortened the period of training in commercial novels when he began to write a transitional fiction  his series of books about the detective Maigret. From the Maigrets he moved on rapidly to the tense psychological novel of less than two hundred pages  known to his thousands of European readers as "a simenon"  and of which he has now written wore than seventy-five. Today, except for an infrequent Maigret, he publishes only serious novels. These books, which he writes in French, are not only translated widely but continually used for movies and television  in adaptations which Simenon does not. supervise, for dramas which he does not see. Mr. Simenon's study in his rambling white house on the edge of Lakeville, Connecticut, after lunch on a January day of bright sun. The room reflects its owner: cheerful, efficient, hospitable, controlled. On its walls are the books of law and medicine, about which he is an expert; the telephone directories from many parts of the world to which he turns in naming his characters; the map of a town where he has just set his forty-ninth Maigret novel*; and the calendar on which he has X-ed out in heavy crayon the days spent writing the Maigret  one day to a chapter  and the three days spent revising it  a labor which he has generously interrupted for this interview. Just one piece of general advice from a writer has been very useful to me. It was from Colette. I was writing short stories for Le Matin, and Colette was literary editor at that time. I remember I gave her two short stories and she returned them and I tried again and tried again. Finally she said, "Look, it is too literary, always too literary." So I followed her advice. It's what I do when I write, the main job when I rewrite. What do you mean by "too literary"? What do you cut out, certain kinds of words? Adjectives, adverbs, and every word which is there just to make an effect. Every sentence which is there just for the sentence. You know, you have a beautiful sentence  cut it. Every time I find such a thing in one of my novels it is to be cut. It's not revising the plot pattern? Oh, I never touch anything of that kind. Sometimes I've changed the names while writing: a woman will be Helen in the first chapter and Charlotte in the second, you know; so in revising I straighten this out. And then, cut, cut, cut. Writing is considered a profession, and I don't think it is a profession. I think that everyone who does not need to be a writer, who thinks he can do something else, ought to do something else. Writing is not a profession but a vocation of unhappiness. I don't think an artist can ever be happy. I know that there are many men who have more or less with more or less intensity the same problems I have and who will be happy to read the book to find the answer  if the answer can possibly be found. Even when the author can't find the answer do the readers profit because the author is meaningfully fumbling for it? That's it. Certainly. I don't remember whether I have ever spoken to you about the feeling I have had for several years. Because society today is without a very strong religion, without a firm hierarchy of social classes, and people are afraid of the big organization in which they are just a little part, for them reading certain novels is a little like looking through the key-hole to know what the neighbor is doing and thinking  does he have the same inferiority complex, the same vices, the same temptations? This is what they are looking for in the work of art. I think many more people today are insecure and are in a search for themselves. There are now so few literary works of the kind Anatole France wrote, for example, you know  very quiet and elegant and reassuring. On the contrary, what people today want are the most complex books, trying to go into every corner of human nature. Do you understand what I mean? I think so. You mean this is not just because today we think we know more about psychology but because more readers need this kind of fiction? Yes. An ordinary man fifty years ago  there are many problems today which he did not know. Fifty years ago he had the answers. He doesn't have them any more. A year or so ago you and I heard a critic ask that the novel today return to the kind of novel which was written in the nineteenth century. It is impossible, completely impossible, I think. [Pausing] Because we live in a time when writers do not always have barriers around them, they can try to present characters by the most complete, the most full expression. You may show love in a very nice story, the first ten months of two lovers, as in the literature of a long time ago. Then you have a second kind of story: they begin to be bored; that was the literature of the end of the last century. And then, if you are free to go further, the man is fifty and tries to have another life, the woman gets jealous, and you have children mixed in it; that is the third story. We are the third story now. We don't stop when they marry, we don't stop when they begin to be bored, we go to the end. In this connection, I often hear people ask about the violence in modern fiction. I'm all for it, but I'd like to ask why you write of it. We are accustomed to see people driven to their limit. And violence is associated with this? More or less. [Pausing] We no longer think of a man from the point of view of some philosophers; for a long time man was always observed from the point of view there was a god and man was the king of creation. We don't think any more that man is the king of creation. We see man almost face to face. Some readers still would like to read very reassuring novels, novels which give them a comforting view of humanity. It can't be done. That's it. But it's not only a question of the artist's looking into himself but also of looking into others with the experience he has of himself. He writes with sympathy because he feels that the other man is like him. If there were no readers you would still write? Certainly. When I began to write I didn't have the idea my books would sell. More exactly, when I began to write I did commercial pieces, stories for magazines and things of that kind  to earn my living, but I didn't call it writing. But for myself, every evening, I did some writing without any idea that it would ever be published. You probably have had as much experience as anybody in the world in doing what you have just called commercial writing. What is the difference between it and non-commercial? I call "commercial" every work, not only in literature but in music and painting and sculpture  any art  which is done for such-and-such a public or for a certain kind of publication or for a particular collection. Of course, in commercial writing there are different grades. You may have things which are very cheap and some very good. The books of the month, for example, are commercial writing; but some of them are almost perfectly done, almost works of art. Not completely, but almost. And the same with certain magazine pieces; some of them are wonderful. But very seldom can they be works of art, because a work of art can't be done for the purpose of pleasing a certain group of readers. How does this change the work? As the author you know whether or not you tailored a novel for a market, but looking at your work from the outside only, what difference would the reader see? The big difference would be in the concessions. In writing for any commercial purpose you have always to make concessions. To the idea that life is orderly and sweet, for example? And the view of morals. Maybe that is the most important. You can't write anything commercial without accepting some code. There is always a code  like the code in Hollywood, and in television and radio. For example, there is now a very good program on television, it is probably the best for plays. The first two acts are always first-class. You have the impression of something completely new and strong, and then at the end the concession comes. Not always a happy end, but something comes to arrange everything from the point of view of a morality or philosophy you know. All the characters, who were beautifully done, change completely in the ten last minutes. In your non-commercial novels you feel no need to make concessions of any sort? I never do that, never, never, never. Otherwise I wouldn't write. It's too painful to do it if it's not to go to the end. You have shown me the manila envelopes you use in starting novels. Before you actually begin writing, how much have you been working consciously on the plan of that particular novel? As you suggest we have to distinguish here between consciously and unconsciously. Unconsciously I probably always have two or three, not novels not ideas about novels but themes in my mind. I never even am thinking that they will serve for a novel; more exactly, they are the things about which I worry for myself. Two days before I write a novel I will consciously take up one of those ideas. But even before I consciously take it up I will first find some atmosphere. Today here there is some sun. I will remember such and such a spring, maybe a spring in some small Italian town or some place in the French provinces or in Arizona, I don't know, and then, little by little a small world will come into my mind, with a few characters. Those characters will be partly from people I have known and partly from pure imagination  you know. It's a complex of both. And then the idea I had before will come and stick around them. They will have the same problem I have in my mind myself. And the problem  with those people  will give me the novel. This is a couple of days before? Yes, a couple of days. Because as soon as I have the beginning I can't bear it very long; so the next day I will take my envelope, take my telephone book for names, and take my town map  you know, to see exactly where things happen. And two days later I will begin. And the beginning will be always the same; it is almost a geometrical question: I have such a man, such a woman, in such surroundings. What can happen to them to oblige them to go to their limit? That's the question. It will be sometimes a very simple incident, anything which will change their lives. Then I write my novel chapter by chapter. What has gone on the planning envelope? Not an outline of the action? No, no. I know nothing about the events when I begin the novel. On the envelope I put only the names of the characters, their ages, their family. I know nothing whatever about the events which will occur later. Otherwise it would not be interesting to me. When do the incidents begin to form? On the eve of the first day I know what will happen in the first chapter. Then, day after day, chapter after chapter, I find what will come later. After I have started a novel I write a chapter each day, without ever missing a day. Because it is a strain, I have to keep pace with the novel. If, for example, I am ill for forty-eight hours I will have to throw away the previous chapters. And I will never return to that novel. When you did commercial fiction, was your method at all similar? No. Not at all. When I did a commercial novel I didn't think about that novel except in the hours of writing it. But when I am doing a novel now I don't see anybody, I don't speak to anybody, I don't take a phone call  I live just like a monk. All the day I am one of my characters. I feel like him. You are the same character all the way through the writing of that novel? Always, because most of my novels show what happens around one character. The other characters are always seen by one character. So it is in this character's skin I have to be. And it's almost unbearable after five or six days. That is one of the reasons my novels are so short; after eleven days I can't  It's impossible. I have to It's physical. I am too tired. I should think so. Especially if you drive the main character to his limit. Yes. And it's awful. That is why, before I start a novel  this may sound foolish here but it is the truth  generally a few days before the start of a novel I look to see that 1 don't have any appointments for eleven days. Then, I call the doctor. He takes my blood pressure, he checks everything. And he says, "0K." Exactly. Because I have to be sure that I am good for the eleven days. Does he come again at the end of the eleven days? What does he find ? The blood pressure is usually down. What does he think of this? Is it all right? He thinks it is all right but unhealthy to do it too often. Yes. Sometimes he will say, "Look, after this novel take two months off." For example, yesterday he said, "OK, but how many novels do you want to do before you go away for the summer?" I said, "Two." "OK," he said. Fine. I'd like to ask now whether you see any pattern in the development of your views as they have worked out in your novels. I am not the one who discovered it, but some critics in France did. All my life, my literary life, if I may say so, I have taken several problems for my novels, and about every ten years I have taken up the same problems from another point of view. I have the impression that I will never, probably, find the answer. I know of certain problems I have taken more than five times. And do you know that you will take those up again? Yes, I will. And then there are a few problems  if I may call them problems  that I know I will never take again, because I have the impression that I went to the end of them. I don't any more care about them. What are some of the problems you have dealt with often and expect to deal with in future? One of them, for example, which will probably haunt me more than any other is the problem of communication. I mean communication between two people. The fact that we are I don't know how many millions of people, yet communication, complete communication, is completely impossible between two of those people to me is one of the biggest tragic themes in the world. When I was a young boy I was afraid of it. I would almost scream because of it. It gave me such a sensation of solitude, of loneliness. That is a theme I have taken I don't know how many times. But I know it will come again. Certainly it will come again. Another seems to be the theme of escape. Between two days changing your life completely: without caring at all what has happened before, just go. You know what I mean? Not even starting over. Going to nothing. I see. Is either of these themes or another not far in the offing as a subject, do you suppose? Or is it harmful to ask this? One is not very far away, probably. It is something on the theme of father and child, of two generations, man coming and man going. That's not completely it, but I don't see it neatly enough just yet to speak about it. This theme could be associated with the theme of lack of communication? That's it; it is another branch of the same problem. What themes do you feel rather certain you will not deal with again? One, I think, is the theme of the disintegration of a unit, and the unit was generally a family. Have you treated this theme often? Two or three times, maybe more. In Pedigree you have it, yes. If I had to choose one of my books to live and not the others, I would never choose Pedigree. What one might you choose? And the next one after that? That's it. It's always the next one. You see, even technically I have the feeling now that I am very far away from the goal. Apart from the next ones, would you be willing to nominate a published novel to survive? No one. Because when a novel is finished I have always the impression that I have not succeeded. I am not discouraged, but I see I want to try again. But one thing  I consider my novels about all on the same level, yet there are steps. After a group of five or six novels I have a kind of  I don't like the word "progress"  but there seems to be a progress. There is a jump in quality, I think. So every five or six novels there is one I prefer to the others. Of the novels now most available which one would you say was one of these? The Brothers Rico. The story might be the same if instead of a gangster you had the cashier of one of our banks or a teacher we might know. A man's position is threatened and so he will do anything to keep it? That's it. A man who always wants to be on top with the small group where he lives. And who will sacrifice anything to stay there. And he maybe a very good man, but he made such an effort to be where he is that he will never accept not to be there any more. I like the simple way that novel does so much. I tried to do it very simply, simply. And there is not a single "literary" sentence there, you know? It's written as by a child. You spoke earlier about thinking of atmosphere when you first think of a novel. What I mean by atmosphere might be translated by "the poetic line." You understand what I mean? Yes. And with the mood goes the season, goes the detail at first it is almost like a musical theme. And so far in no way geographically located? Not at all. That's the atmosphere for me, because I try  and I don't think I have done it, for otherwise the critics would have discovered it  I try to do with prose, with the novel, what generally is done with poetry. I mean I try to go beyond the real, and the explainable ideas, and to explore the man  not doing it by the sound of the words as the poetical novels of the beginning of the century tried to do. I can't explain technically but  I try to put in my novels some things which you can't explain. To give some message which does not exist practically. You understand what I mean? I read a few days ago that T. S. Eliot, whom I admire very much, wrote that poetry is necessary in plays having one kind of story and not in plays having another, that it depends on the subject you treat. I don't think so. I think you may have the same secret message to give with any kind of subject. If your vision of the world is of a certain kind you will put poetry in everything, necessarily. But I am probably the only one who thinks there is something of this kind in my books. One time you spoke about your wish to write the "pure" novel. Is this what you were speaking of a while ago  about cutting out the "literary" words and sentences  or does it also include the poetry you have just spoken of? The "pure" novel will do only what the novel can do. I mean that it doesn't have to do any teaching or any work of journalism. In a pure novel you wouldn't take sixty pages to describe the South or Arizona or some country in Europe. Just the drama with only what is absolutely part of this drama. What I think about novels today is almost a translation of the rules of tragedy into the novel. I think the novel is the tragedy for our day. Is length important? Is it part of your definition of the pure novel? Yes. That sounds like a practical question, but I think it is important, for the same reason you can't see a tragedy in more than one sitting. I think that the pure novel is too tense for the reader to stop in the middle and take it up the next day. Because television and movies and magazines are under the codes you have spoken of, I take it you feel the writer of the pure novel is almost obligated to write freely. Yes. And there is a second reason why he should be. I think that now, for reasons probably political, propagandists are trying to create a type of man. I think the novelist has to show man as he is and not the man of propaganda. And I do not mean only political propaganda; I mean the man they teach in the third grade of school, a man who has nothing to do with man as he really is. What is your experience with conversion of your books for movies and radio? These are very important for the writer today. For they are probably the way the writer may still be independent. You asked me before whether I ever change anything in one of my novels commercially. I said, "No." But I would have to do it without the radio, television, and movies. You once told me Gide made a helpful practical suggestion about one of your novels. Did he influence your work in any more general way? I don't think so. But with Gide it was funny. In 1936 my publisher said he wanted to give a cocktail party so we could meet, for Gide had said he had read my novels and would like to meet me. So I went, and Gide asked me questions for more than two hours. After that I saw him many times. And he wrote me almost every month and sometimes oftener until he died. Always to ask questions. 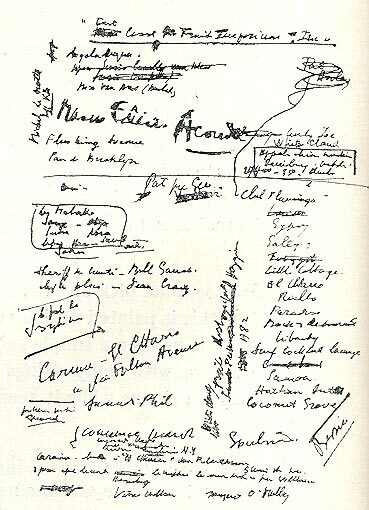 When I went to visit him I always saw my books with so many notes in the margins that it was almost more Gide than Simenon. I never asked him about them; I was very shy about it. So now I will never know. Did he ask you any special kinds of questions? Everything, but especially about the mechanism of my  may I use the word? it seems pretentious  creation. And I think I know why he was interested. I think Gide all his life had the dream of being the creator instead of the moralist, the philosopher. I was exactly his opposite, and I think that is why he was interested. I had the same experience five years before with Count Keyserling. He wrote me exactly the same way Gide did. He asked me to visit him at Darmstadt. I went there and he asked me questions for three days and three nights. He came to see me in Paris and asked me more questions and gave me a commentary on each of my books. For the same reason. Keyserling called me an "imbécile de génie." I remember you once told me that in your commercial novels you would sometimes insert a non-commercial passage or chapter. How did that part differ from the rest of its novel? Instead of writing just the story, in this chapter I tried to give a third dimension, not necessarily to the whole chapter, perhaps to a room, to a chair, to some object. It would be easier to explain it in the terms of painting. To give the weight. A commercial painter paints flat; you can put your finger through. But a painter  for example an apple by Cézanne has weight. And it has juice, everything. With just three strokes. I tried to give to my words just the weight that a stroke of Cézanne's gave to an apple. That is why most of the time I use concrete words. I try to avoid abstract words. Or poetical words, you know, like "crepuscule," for example. It is very nice, but it gives nothing. Do you understand? To avoid every stroke which does not give something to this third dimension. On this point, I think that what the critics call my "atmosphere" is nothing but the Impressionism of the painter adapted to literature. My childhood was spent at the time of the Impressionists and I was always in the museums and exhibitions. That gave me a kind of sense of it. I was haunted by it. Have you ever dictated fiction, commercial or any other? No. I am an artisan; I need to work with my hands. I would like to carve my novel in a piece of wood. My characters  I would like to have them heavier, more three-dimensional. And I would like to make a man so that everybody, looking at him, would find his own problems in this man. That's why I spoke about poetry, because this goal looks more like a poet's goal than the goal of a novelist. My characters have a profession, have characteristics; you know their age, their family situation, and everything. But I try to make each one of those characters heavy, like a statue, and to be the brother of everybody in the world. [Pausing] And what makes me happy is the letters I get. They never speak about my beautiful style; they are the letters a man would write to his doctor or his psychoanalyst. They say, "You are one who understands me. So many times I find myself in your novels." Then there are pages of their confidences; and they are not crazy people. There are crazy people too, of course; but many are on the contrary people who  even important people. I am surprised. Early in your life did any particular book or author especially impress you? Probably the one who impressed me most was Gogol. And certainly Dostoievski, but less then Gogol. Maybe because he makes characters who are just like everyday people but at the same time have what I called a few minutes ago the third dimension I am looking for. All of them have this poetic aura. But not the Oscar Wilde kind. A poetry which comes naturally, which is there. The kind Conrad has. Each character has the weight of sculpture, it is so heavy, so dense. Dostoievski said of himself and some of his fellow writers that they came out from Gogol's Overcoat and now you feel you do too. When you and I were discussing a particular trial while it was going on a year or two ago, you said you often followed such newspaper accounts with interest. Do you ever in following them say to yourself, "This is something I might some day work into a novel?" Do you consciously file it away? No. I just forget I said it might be useful some day, and three or four or ten years later it comes. I don't keep a file. Speaking of trials, what would you say is the fundamental difference, if there is any, between your detective fiction  such as the Maigret which you finished a few days ago  and your more serious novels? Exactly the same difference that exists between the painting of a painter and the sketch he will make for his pleasure or for his friends or to study something. In the Maigrets you look at the character only from the point of view of the detective? Yes. Maigret can't go inside a character. He will see, explain, and understand; but he does not give the character the weight the character should have in another of my novels. So in the eleven days spent writing a Maigret novel your blood pressure does not change much? You are not driving the detective to the limit of his endurance. That's it. So I only have the natural fatigue of being so many hours at the typewriter. But otherwise, no. One more question, if I may. Has published, general criticism ever in any way made you consciously change the way you write? From what you say I should imagine not. Never. [Pausing, and looking down] I have a very, very strong will about my writing, and I will go my way. For instance, all the critics for twenty years have said the same thing: "It is time for Simenon to give us a big novel, a novel with twenty or thirty characters." They do not understand. I will never write a big novel. My big novel is the mosaic of all my small novels. [Looking up] You understand? 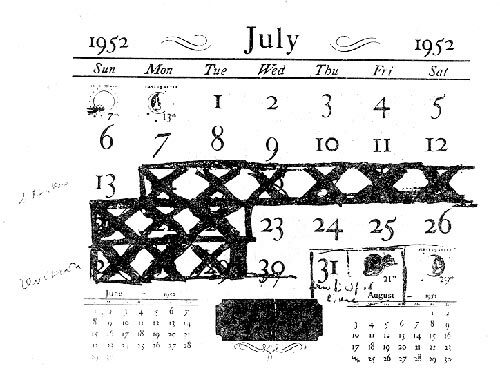 Above, the 11 × 16 inch calendar sheet on which Simenon marked off in black each day of his writing The Brothers Rico, one chapter a day, and in red the three days spent revising it. 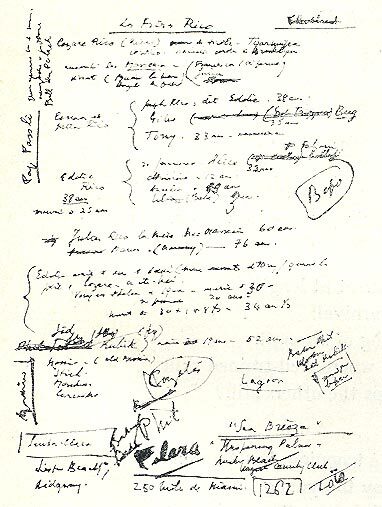 Below, the two sides of a 7 × 10 brown manila envelope on which Simenon began consciously shaping the characters of The Brothers Rico two days before he began the novel on July 14, 1952. CARVEL COLLINS is Professor of English at the Massachusetts Institute of Technology, and author of a number of books and articles on American literature and modern fiction. He is teaching this summer at the Salzburg Seminar. 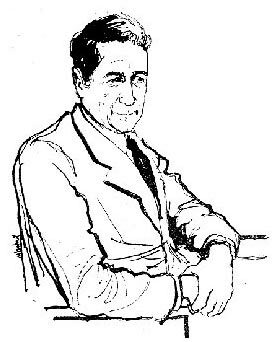 WILLIAM MARSHALL (Sketch of Georges Simenon) is an Australian artist living in Paris. He draws a daily cartoon strip entitled Le Crime ne paie pas which appears in France-Soir and other papers in Europe and the Near-East. B. WHISTLER DABNEY (cover drawing) is a twenty-two year old artist living in Paris. She has done a number of illustrations for French magazines, including Realités. Many of her illustrations have appeared in former numbers of this magazine.